These are pieces of bachman track. They have the black stuff on the bottom so they can be used on carpet. It also looks more realistic for a new modeler and gives the trains a more stable base. From top to bottom they are called a curve, straight, and a switch. Switches come in left and right hand models. The switches shown here are manual(you have to switch them by hand). These are two different cheap power packs and their terminal tracks from different companies. 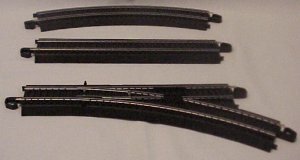 These are a couple of different pieces of track. From Left to right they are a switch(it is automatic(you can switch it by pressing a button on the controller it comes with)) (this switch also comes in a left and right hand version), curve piece of switch, figure eight piece, half straight piece, curve piece, straight piece, and at the top is a bumper piece with the bumper on it.